This year’s scholarships will be awarded in memory of Edward C. Boye, an East Windsor resident who relied on his bicycle for transportation and who was killed by a motorist in February. Click here for 2010 WWBPA Student Scholarship. 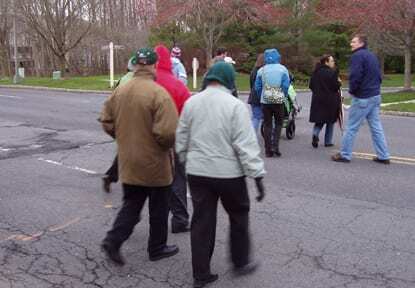 Paul Kiczek, a Morristown resident, is among those organizing The Big Walk, a 50-mile trek from the Metropark Station in Iselin to Penn Station in New York on Sunday, May 23. It is expected to take 17 hours beginning at 5 a.m. and concluding at 10 p.m. The route will go near Liberty State Park and use PATH to get from Exchange Place to World Trade Center, but the final seven miles to Penn Station will again be on foot. Walkers are invited to join in, even for just part of the route, which will use part of the East Coast Greenway. The event is free. Register at NJ2NY50. Sponsor a walker here. Why 50 miles? The idea of 50-mile walks dates back in the 1963 when President Kennedy challenged people to actively pursue a better, healthier lifestyle. Mr. Kiczek, for one, has tried twice–back in 1963 and last year. He didn’t make it either time but is determined to succeed this time. Please join us for the West Windsor Bicycle and Pedestrian Alliance’s annual meeting on April 8. We will be discussing ways we can make our community safer for bicyclists and pedestrians in 2010 and beyond. Tell us your concerns and ideas! We also will vote on trustees. There is an opening on the board; if you are interested, please email wwbikeped@gmail.com. Include a bit about yourself and what you’d like to see accomplished. The meeting starts at 7 p.m. at the West Windsor Municipal Center, 271 Clarksville Road. Feel free to bring friends/non-members. Please note: This meeting had been scheduled for Feb. 25 but was postponed due to inclement weather. At that time, Andy Clarke, executive director of the League of American Bicyclists, was to be our guest speaker, but he can’t make it on April 8. We are working with Andy to find another date. 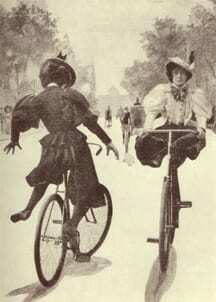 What keeps women and girls from bicycling more? 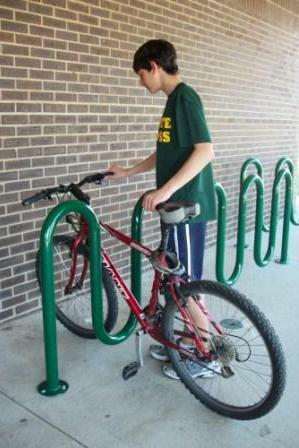 Take part take in a survey about bicycle use (or non-use) and barriers to getting on bikes. This free webinar is open to the public. March 31, 2010 from 3:00 p.m. – 4:30 p.m. Eastern time. Women, a recent article in Scientific American said, are considered an indicator for bicycle-friendly cities because they, more than men, tend to want safe bike infrastructure and routes that go to practical places. And that cycling survey for women? Interim results will be reported during the webinar, and final results will released after May 15 as part of National Bike Month. Great news for making our communities friendlier for bicyclists and pedestrians! One sign of DOT’s new thinking came as it awarded $1.5 billion to projects using stimulus funding. Read more. The Community Design Group in Minneapolis entered this Public Service Announcement about complete streets in the 2010 University of Minnesota’s School of Public Health Design Contest. 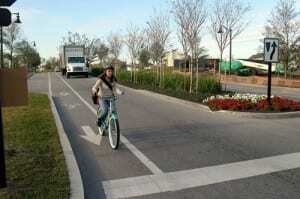 Read the WWBPA post New Jersey Adopts Complete Streets Policy. Dinky Becomes BRT with Bike/Ped Lane? 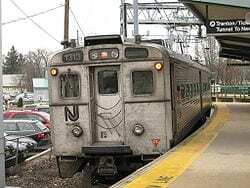 As planning continues for Bus Rapid Transit (BRT) in the Route 1 corridor, interest (both pro and con) grows in the fate of the Dinky, the unique connector train from Princeton to Princeton Junction that has been around for 145 years. Comments Off on Dinky Becomes BRT with Bike/Ped Lane? 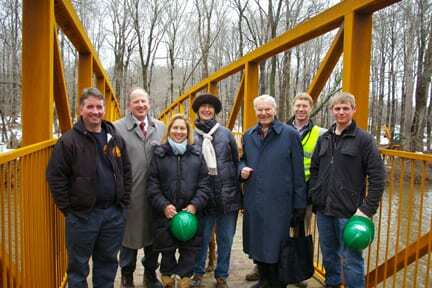 Stony Brook Bridge completes a missing link. 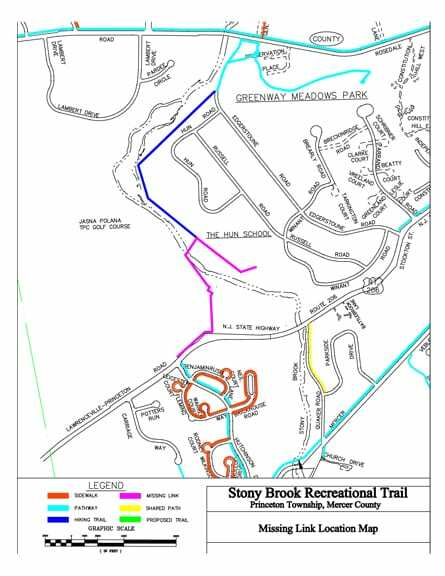 The addition of a new bike/ped bridge, near Jasna Polana and the Hun School, completes a missing link in the Stony Brook Regional Bicycle and Pedestrian Pathway, allowing users to travel off-road or on lightly-traveled roads from the Princeton Battlefield to Princeton Day School and on to Hopewell. 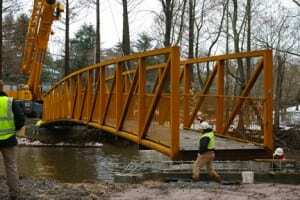 Read more about the trail and the bridge installation in Town Topics. Read about the Pedestrian Bridge Project History. Click here for Princeton Bikepaths and Sidewalks Map. Are you trying to find the best way to bike to work or to the beach? Google Maps now provides routes by car, public transit, walking, and bicycling. The Google team hasn’t been to all of the United States, but has gathered data and recommended routes from people around the country. In fact, they’re still gathering data and would be happy to have you add suggestions and report problems to the team. Google Bicycling directions are in beta. Use caution and please report unmapped bike routes, streets that aren’t suited for cycling, and other problems on the Google Maps site. Google Walking directions are also in beta. Use caution – The routes may be missing sidewalks or pedestrian paths. Analyzing data from the 2009 National Household Travel Survey (Federal Highway Administration), the Tri-State Transportation Campaign shows a 4.4% decrease in driving since 2001. Walking and bicycling are up more than 25% and the use of mass transit is up more than 23%. Representative Earl Blumenauer (D-OR) introduced the Active Community Transportation (ACT) Act of 2010 on March 2. ACT transportation grants to communities would help fund sidewalks and bicycle paths, improve health, and create jobs. Funds would be set aside from the Surface Transportation Program. You can help promote this legislation by writing to your congressional representatives and asking that they sign on as co-sponsors of the legislation. Ask your senators to introduce similar legislation in the Senate. Across all grades, the family car and school bus were the two most frequently used options for travel to/from school. Walking was a distant third. However, there are notable differences between how students in lower grades (K-5th) and higher grades (6th-8th) travel to school. The percentage of students traveling to or from school by foot or bicycle peaked in fifth grade at 24%. One reason it may drop off in later grades is that schools are farther from home. More students arrive at school in the family car than leave by car in the afternoon. The majority of those afternoon trips shifted to riding the school bus or walking. 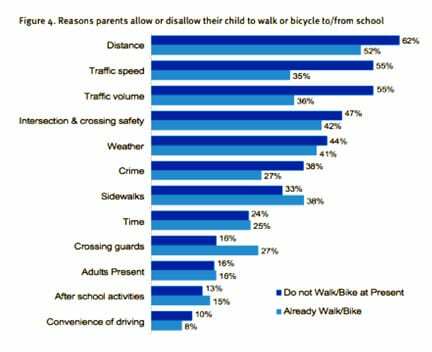 Safety factors, like traffic speed and volume and street crossing safety, were frequently selected as barriers by parents who live within one half mile of school but do not allow their children to walk or bicycle to/from school. Weather was only marginally related to students’ morning travel mode. Comments Off on How Do Kids Get to School? On July 10th 2010, 200+ riders and support crew members will depart for a grueling one-week, 500 mile marathon ride that begins in Charlottesville,VA and end at Quaker Bridge Mall. To raise money necessary to keep open the doors of Trenton-based Anchor House. Your support will help to sustain its many programs available to the thousands of kids and their families whose lives that have been impacted by Anchor House for 32 years. Anchor House, Inc. is a multi-service agency for runaway, homeless, abused, and at-risk youth and their families. For the past 30 years, Anchor House has committed its efforts to providing comprehensive, life-saving assistance to our most vulnerable population. 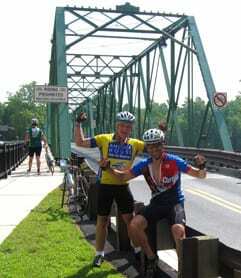 In 2009, several WWBPA members, including Ken Carlson, Jerry Foster, and Daryl McMillan, participated in the ride. You can read more about this year’s ride here. To sign up (applications are due by March 5) or to sponsor the riders, go to anchorhouseride.org. This year on July 26th, we will celebrate the 20th anniversary of the passage of the Americans with Disabilities Act (ADA). Some time after passage of the ADA, on July 13, 1992, the Township of West Windsor adopted a resolution approving its ADA Transition Plan (the Plan), as required by federal law. The Plan documented the items of ADA non-compliance and undertook to rectify them all by January 26, 1995, also as required by federal law. In the last month, some West Windsor residents did a partial audit to determine which items in the Plan had been rectified, which had not, and which items post-dating the Plan, and therefore also post-dating the passage of the ADA, were still not ADA-compliant. I present to you our report. I assume that you will not grant me time to go through the report item by item at this time, but I will summarize by saying that there are major violations with virtually all the sites inspected, including the very stepped platform upon which you are seated, and which the Township pledged to make wheelchair-accessible by January 26, 1995, over fifteen years ago. When can we expect these and other non-compliant items to be rectified? Until they are rectified, the Township is in violation of federal law. The Plan has never been updated. 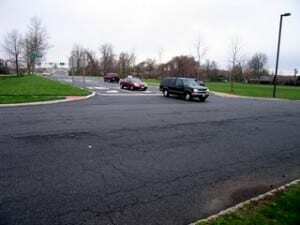 When does the Township intend to update its Plan, as required by the ADA? The law requires that “the plan should be updated periodically.” I suspect that 18 years is a rather greater interval than Congress had intended. 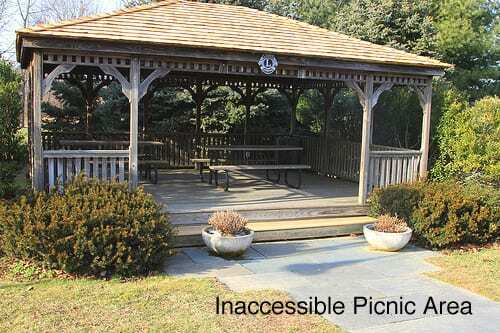 Will the Township create an independent Accessibility Committee, as several New Jersey Townships have done, to monitor its ADA compliance, ensure that such lapses do not reoccur, and promote the accessibility needs of its disabled residents and visitors? It would be appropriate for this committee to be formed and functioning well before the July 26th ADA anniversary date. Will the Township and its officials, to show its commitment to the ADA, join with other local, state and federal government officials in celebrating the 20th anniversary of the signing of the ADA this July 26th, 2010?